Calcium-activated potassium channel subunit alpha-1 also known as large conductance calcium-activated potassium channel, subfamily M, alpha member 1 (KCa1.1), or BK for short, is a voltage gated potassium channel encoded by the KCNMA1 gene and characterized by their large conductance of potassium ions (K+) through cell membranes. BK channels are activated (opened) by changes in membrane electrical potential and/or by increases in concentration of intracellular calcium ion (Ca2+). Opening of BK channels allows K+ to passively flow through the channel, down the electrochemical gradient. Under typical physiological conditions, this results in an efflux of K+ from the cell, which leads to cell membrane hyperpolarization (a decrease in the electrical potential across the cell membrane) and a decrease in cell excitability (a decrease in the probability that the cell will transmit an action potential). BK channels are essential for the regulation of several key physiological processes including smooth muscle tone and neuronal excitability. They control the contraction of smooth muscle and are involved with the electrical tuning of hair cells in the cochlea. BK channels also contribute to the behavioral effects of ethanol in the worm C. elegans under high concentrations (> 100 mM, or approximately 0.50% BAC). It remains to be determined if BK channels contribute to intoxication in humans. BK channels have a tetrameric structure. Each monomer of the channel-forming alpha subunit is the product of the KCNMA1 gene. Modulatory beta subunits (encoded by KCNMB1, KCNMB2, KCNMB3, or KCNMB4) can associate with the tetrametic channel. Alternatively spliced transcript variants encoding different isoforms have been identified. A unique transmembrane domain (S0) that precedes the 6 transmembrane domains (S1-S6) conserved in all voltage-dependent K+ channels. A voltage sensing domain (S1-S4). A K+ channel pore domain (S5, selectivity filter, and S6). A cytoplasmic C-terminal domain (CTD) consisting of a pair of RCK domains that assemble into an octameric gating ring on the intracellular side of the tetrameric channel. The CTD contains four primary binding sites for Ca2+, called "calcium bowls", encoded within the second RCK domain of each monomer. BK channels are pharmacological targets for the treatment of stroke. Various pharmaceutical companies developed synthetic molecules activating these channels in order to prevent excessive neurotoxic calcium entry in neurons. But BMS-204352 (MaxiPost) a molecule developed by Bristol-Myers Squibb failed to improve clinical outcome in stroke patients compared to placebo. BK channels have also been found to be activated by exogenous pollutants and endogenous gazotransmitters carbon monoxide and hydrogen sulphide. BK channels are blocked by tetraethylammonium (TEA), paxilline and iberiotoxin. ↑ "Drugs that physically interact with Calcium-activated potassium channel subunit alpha-1 view/edit references on wikidata". 1 2 3 "Entrez Gene: KCNMA1 potassium large conductance calcium-activated channel, subfamily M, alpha member 1". ↑ Miller C (2000). "An overview of the potassium channel family". Genome Biol. 1 (4): reviews0004.1–reviews0004.5. doi:10.1186/gb-2000-1-4-reviews0004. PMC 138870 . PMID 11178249. 1 2 3 4 Yuan P, Leonetti MD, Pico AR, Hsiung Y, MacKinnon R (July 2010). "Structure of the human BK channel Ca2+-activation apparatus at 3.0 A resolution". Science. 329 (5988): 182–6. Bibcode:2010Sci...329..182Y. doi:10.1126/science.1190414. PMC 3022345 . PMID 20508092. ↑ Davies AG, Pierce-Shimomura JT, Kim H, VanHoven MK, Thiele TR, Bonci A, Bargmann CI, McIntire SL (December 2003). "A central role of the BK potassium channel in behavioral responses to ethanol in C. elegans". Cell. 115 (6): 655–66. doi:10.1016/S0092-8674(03)00979-6. PMID 14675531. ↑ Wallner M, Meera P, Toro L (1996). "Determinant for beta-subunit regulation in high-conductance voltage-activated and Ca(2+)-sensitive K+ channels: an additional transmembrane region at the N terminus". Proceedings of the National Academy of Sciences of the United States of America. 93 (25): 14922–7. Bibcode:1996PNAS...9314922W. doi:10.1073/pnas.93.25.14922. PMC 26238 . PMID 8962157. 1 2 3 Wu Y, Yang Y, Ye S, Jiang Y (2010). "Structure of the gating ring from the human large-conductance Ca2+-gated K+ channel". Nature. 466 (7304): 393–397. Bibcode:2010Natur.466..393W. doi:10.1038/nature09252. PMC 2910425 . PMID 20574420. ↑ Jiang Y, Pico A, Cadene M, Chait BT, MacKinnon R (2001). "Structure of the RCK domain from the E. Coli K+ channel and demonstration of its presence in the human BK channel". Neuron. 29 (3): 593–601. doi:10.1016/S0896-6273(01)00236-7. PMID 11301020. ↑ Pico A. 2003. RCK domain model of calcium activation in BK channels. PhD thesis. The Rockfeller University, New York. ↑ Yusifov T, Savalli N, Gandhi CS, Ottolia M, Olcese R (2008). 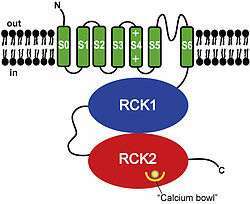 "The RCK2 domain of the human BKCa channel is a calcium sensor". Proceedings of the National Academy of Sciences. 105 (1): 376–81. Bibcode:2008PNAS..105..376Y. doi:10.1073/pnas.0705261105. PMC 2224220 . PMID 18162557. 1 2 Schreiber M, Salkoff L (1997). "A novel calcium-sensing domain in the BK channel". Biophysical Journal. 73 (3): 1355–1363. Bibcode:1997BpJ....73.1355S. doi:10.1016/S0006-3495(97)78168-2. PMC 1181035 . PMID 9284303. 1 2 3 Yuan P, Leonetti MD, Hsiung Y, MacKinnon R (2011). "Open structure of the Ca2+ gating ring in the high-conductance Ca2+-activated K+ channel". Nature. 481 (7379): 94–97. Bibcode:2012Natur.481...94Y. doi:10.1038/nature10670. PMC 3319005 . PMID 22139424. ↑ Gribkoff VK, Winquist RJ (May 2005). "Voltage-gated cation channel modulators for the treatment of stroke". Expert Opin Investig Drugs. 14 (5): 579–92. doi:10.1517/13543784.14.5.579. PMID 15926865. ↑ Gribkoff VK, Starrett JE, Dworetzky SI (April 2001). "Maxi-K potassium channels: form, function, and modulation of a class of endogenous regulators of intracellular calcium". Neuroscientist. 7 (2): 166–77. doi:10.1177/107385840100700211. PMID 11496927. ↑ Jensen BS (2002). "BMS-204352: a potassium channel opener developed for the treatment of stroke". CNS Drug Rev. 8 (4): 353–60. doi:10.1111/j.1527-3458.2002.tb00233.x. PMID 12481191. ↑ Dubuis E, Potier M, Wang R, Vandier C (February 2005). "Continuous inhalation of carbon monoxide attenuates hypoxic pulmonary hypertension development presumably through activation of BKCa channels". Cardiovasc. Res. 65 (3): 751–61. doi:10.1016/j.cardiores.2004.11.007. PMID 15664403. ↑ Hou S, Xu R, Heinemann SH, Hoshi T (March 2008). "The RCK1 high-affinity Ca2+ sensor confers carbon monoxide sensitivity to Slo1 BK channels". Proc. Natl. Acad. Sci. U.S.A. 105 (10): 4039–43. Bibcode:2008PNAS..105.4039H. doi:10.1073/pnas.0800304105. PMC 2268785 . PMID 18316727. ↑ Sitdikova GF, Weiger TM, Hermann A (February 2010). "Hydrogen sulfide increases calcium-activated potassium (BK) channel activity of rat pituitary tumor cells". Pflugers Arch. 459 (3): 389–97. doi:10.1007/s00424-009-0737-0. PMID 19802723. ↑ Candia S, Garcia ML, Latorre R (August 1992). "Mode of action of iberiotoxin, a potent blocker of the large conductance Ca(2+)-activated K+ channel". Biophys. J. 63 (2): 583–90. Bibcode:1992BpJ....63..583C. doi:10.1016/S0006-3495(92)81630-2. PMC 1262182 . PMID 1384740. Magleby KL (2003). "Gating mechanism of BK (Slo1) channels: so near, yet so far.". J. Gen. Physiol. 121 (2): 81–96. doi:10.1085/jgp.20028721. PMC 2217328 . PMID 12566537. Wei AD, Gutman GA, Aldrich R, et al. (2006). "International Union of Pharmacology. LII. Nomenclature and molecular relationships of calcium-activated potassium channels.". Pharmacol. Rev. 57 (4): 463–72. doi:10.1124/pr.57.4.9. PMID 16382103. McCobb DP, Fowler NL, Featherstone T, et al. (1995). "A human calcium-activated potassium channel gene expressed in vascular smooth muscle.". Am. J. Physiol. 269 (3 Pt 2): H767–77. PMID 7573516. Butler A, Tsunoda S, McCobb DP, et al. (1993). "mSlo, a complex mouse gene encoding "maxi" calcium-activated potassium channels.". Science. 261 (5118): 221–4. Bibcode:1993Sci...261..221B. doi:10.1126/science.7687074. PMID 7687074. Dworetzky SI, Trojnacki JT, Gribkoff VK (1995). "Cloning and expression of a human large-conductance calcium-activated potassium channel.". Brain Res. Mol. Brain Res. 27 (1): 189–93. doi:10.1016/0169-328X(94)90203-8. PMID 7877450. Pallanck L, Ganetzky B (1995). "Cloning and characterization of human and mouse homologs of the Drosophila calcium-activated potassium channel gene, slowpoke.". Hum. Mol. Genet. 3 (8): 1239–43. doi:10.1093/hmg/3.8.1239. PMID 7987297. Tseng-Crank J, Foster CD, Krause JD, et al. (1995). "Cloning, expression, and distribution of functionally distinct Ca(2+)-activated K+ channel isoforms from human brain.". Neuron. 13 (6): 1315–30. doi:10.1016/0896-6273(94)90418-9. PMID 7993625. Knaus HG, Folander K, Garcia-Calvo M, et al. (1994). "Primary sequence and immunological characterization of beta-subunit of high conductance Ca(2+)-activated K+ channel from smooth muscle.". J. Biol. Chem. 269 (25): 17274–8. PMID 8006036. Meera P, Wallner M, Jiang Z, Toro L (1996). "A calcium switch for the functional coupling between alpha (hslo) and beta subunits (KV,Ca beta) of maxi K channels.". FEBS Lett. 382 (1-2): 84–8. doi:10.1016/0014-5793(96)00151-2. PMID 8612769. Wallner M, Meera P, Ottolia M, et al. (1996). "Characterization of and modulation by a beta-subunit of a human maxi KCa channel cloned from myometrium.". Recept. Channels. 3 (3): 185–99. PMID 8821792. Meera P, Wallner M, Song M, Toro L (1998). "Large conductance voltage- and calcium-dependent K+ channel, a distinct member of voltage-dependent ion channels with seven N-terminal transmembrane segments (S0-S6), an extracellular N terminus, and an intracellular (S9-S10) C terminus.". Proc. Natl. Acad. Sci. U.S.A. 94 (25): 14066–71. Bibcode:1997PNAS...9414066M. doi:10.1073/pnas.94.25.14066. PMC 28433 . PMID 9391153. Díaz L, Meera P, Amigo J, et al. (1999). "Role of the S4 segment in a voltage-dependent calcium-sensitive potassium (hSlo) channel.". J. Biol. Chem. 273 (49): 32430–6. doi:10.1074/jbc.273.49.32430. PMID 9829973. Wallner M, Meera P, Toro L (1999). "Molecular basis of fast inactivation in voltage and Ca2+-activated K+ channels: a transmembrane beta-subunit homolog.". Proc. Natl. Acad. Sci. U.S.A. 96 (7): 4137–42. Bibcode:1999PNAS...96.4137W. doi:10.1073/pnas.96.7.4137. PMC 22433 . PMID 10097176. Valverde MA, Rojas P, Amigo J, et al. (1999). "Acute activation of Maxi-K channels (hSlo) by estradiol binding to the beta subunit.". Science. 285 (5435): 1929–31. doi:10.1126/science.285.5435.1929. PMID 10489376. Brenner R, Jegla TJ, Wickenden A, et al. (2000). "Cloning and functional characterization of novel large conductance calcium-activated potassium channel beta subunits, hKCNMB3 and hKCNMB4.". J. Biol. Chem. 275 (9): 6453–61. doi:10.1074/jbc.275.9.6453. PMID 10692449. Liu QH, Williams DA, McManus C, et al. (2000). "HIV-1 gp120 and chemokines activate ion channels in primary macrophages through CCR5 and CXCR4 stimulation.". Proc. Natl. Acad. Sci. U.S.A. 97 (9): 4832–7. Bibcode:2000PNAS...97.4832L. doi:10.1073/pnas.090521697. PMC 18318 . PMID 10758170. Quirk JC, Reinhart PH (2001). "Identification of a novel tetramerization domain in large conductance K(ca) channels.". Neuron. 32 (1): 13–23. doi:10.1016/S0896-6273(01)00444-5. PMID 11604135. Soto MA, González C, Lissi E, et al. (2002). "Ca(2+)-activated K+ channel inhibition by reactive oxygen species.". Am. J. Physiol., Cell Physiol. 282 (3): C461–71. doi:10.1152/ajpcell.00167.2001. PMID 11832330. Wang YW, Ding JP, Xia XM, Lingle CJ (2002). "Consequences of the stoichiometry of Slo1 alpha and auxiliary beta subunits on functional properties of large-conductance Ca2+-activated K+ channels.". J. Neurosci. 22 (5): 1550–61. PMID 11880485.